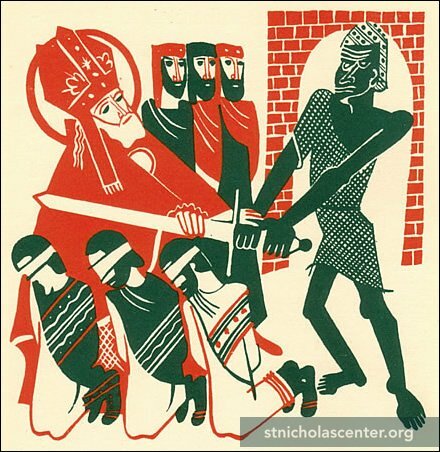 Under the Roman Emperor Diocletian, who ruthlessly persecuted Christians, Bishop Nicholas suffered for his faith, was exiled and imprisoned. 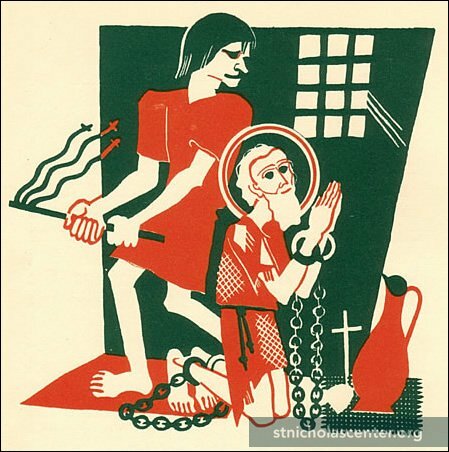 The prisons were so full of bishops, priests, and deacons, there was no room for the real criminals—murderers, thieves and robbers. After his release, Nicholas attended the Council of Nicaea in AD 325. He died December 6, AD 343 in Myra and was buried in his cathedral church, where a unique relic, calledmanna, formed in his grave. This liquid substance, said to have healing powers, fostered the growth of devotion to Nicholas. 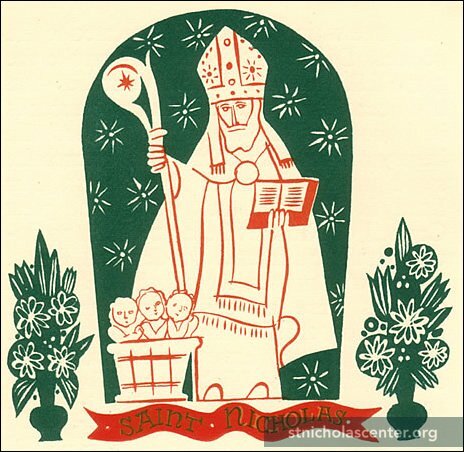 The anniversary of his death became a day of celebration, St. Nicholas Day, December 6th (December 19 on the Julian Calendar). 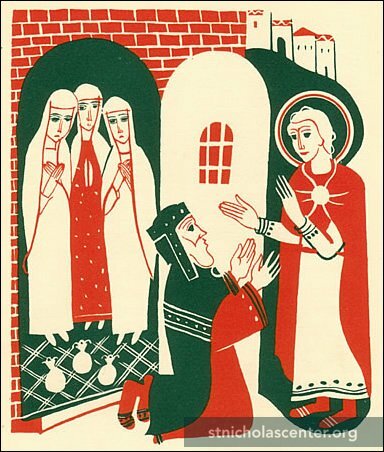 Artist: Elisabeth JvanovskyOne story tells of a poor man with three daughters. In those days a young woman's father had to offer prospective husbands something of value—a dowry. The larger the dowry, the better the chance that a young woman would find a good husband. Without a dowry, a woman was unlikely to marry. This poor man's daughters, without dowries, were therefore destined to be sold into slavery. Mysteriously, on three different occasions, a bag of gold appeared in their home-providing the needed dowries. The bags of gold, tossed through an open window, are said to have landed in stockings or shoes left before the fire to dry. This led to the custom of children hanging stockings or putting out shoes, eagerly awaiting gifts from Saint Nicholas. Sometimes the story is told with gold balls instead of bags of gold. That is why three gold balls, sometimes represented as oranges, are one of the symbols for St. Nicholas. And so St. Nicholas is a gift-giver. 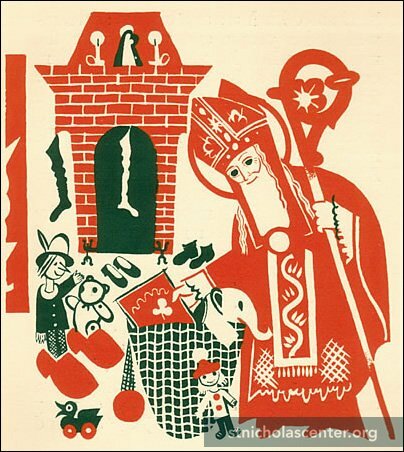 One of the oldest stories showing St. Nicholas as a protector of children takes place long after his death. The townspeople of Myra were celebrating the good saint on the eve of his feast day when a band of Arab pirates from Crete came into the district. They stole treasures from the Church of Saint Nicholas to take away as booty. As they were leaving town, they snatched a young boy, Basilios, to make into a slave. The emir, or ruler, selected Basilios to be his personal cupbearer, as not knowing the language, Basilios would not understand what the king said to those around him. So, for the next year Basilios waited on the king, bringing his wine in a beautiful golden cup. For Basilios' parents, devastated at the loss of their only child, the year passed slowly, filled with grief. As the next St. Nicholas' feast day approached, Basilios' mother would not join in the festivity, as it was now a day of tragedy. However, she was persuaded to have a simple observance at home—with quiet prayers for Basilios' safekeeping. Meanwhile, as Basilios was fulfilling his tasks serving the emir, he was suddenly whisked up and away. 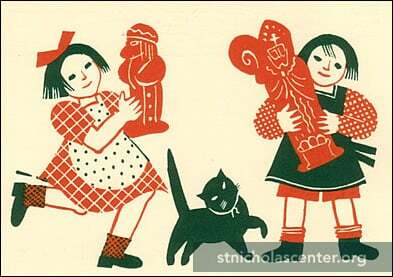 St. Nicholas appeared to the terrified boy, blessed him, and set him down at his home back in Myra. Imagine the joy and wonderment when Basilios amazingly appeared before his parents, still holding the king's golden cup. This is the first story told of St. Nicholas protecting children—which became his primary role in the West. Artist: Elisabeth JvanovskyAnother story tells of three theological students, traveling on their way to study in Athens. A wicked innkeeper robbed and murdered them, hiding their remains in a large pickling tub. It so happened that Bishop Nicholas, traveling along the same route, stopped at this very inn. In the night he dreamed of the crime, got up, and summoned the innkeeper. As Nicholas prayed earnestly to God the three boys were restored to life and wholeness. In France the story is told of three small children, wandering in their play until lost, lured, and captured by an evil butcher. 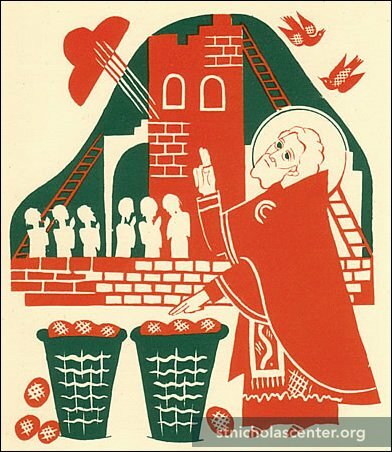 St. Nicholas appears and appeals to God to return them to life and to their families. 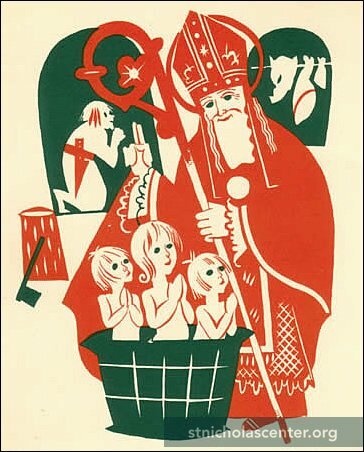 And so St. Nicholas is thepatron and protector of children. Artist: Elisabeth JvanovskySeveral stories tell of Nicholas and the sea. When he was young, Nicholas sought the holy by making a pilgrimage to the Holy Land. There as he walked where Jesus walked, he sought to more deeply experience Jesus' life, passion, and resurrection. Returning by sea, a mighty storm threatened to wreck the ship. Nicholas calmly prayed. The terrified sailors were amazed when the wind and waves suddenly calmed, sparing them all. 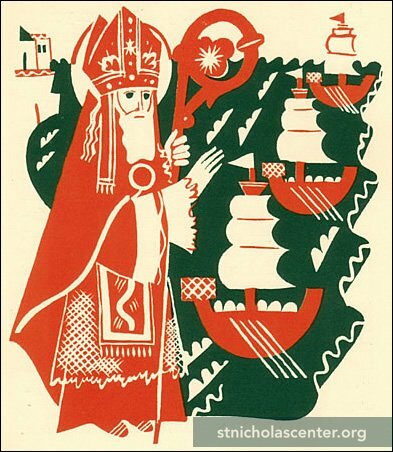 And so St. Nicholas is the patron of sailors and voyagers. Other stories tell of Nicholas saving his people from famine, sparing the lives of those innocently accused, and much more. He did many kind and generous deeds in secret, expecting nothing in return. Within a century of his death he was celebrated as a saint. Today he isvenerated in the East as wonder, or miracle worker and in the West as patron of a great variety of persons-children, mariners, bankers, pawn-brokers, scholars, orphans, laborers, travelers, merchants, judges, paupers, marriageable maidens, students, children, sailors, victims of judicial mistakes, captives, perfumers, even thieves and murderers! He is known as the friend and protector of all in trouble or need (see list). 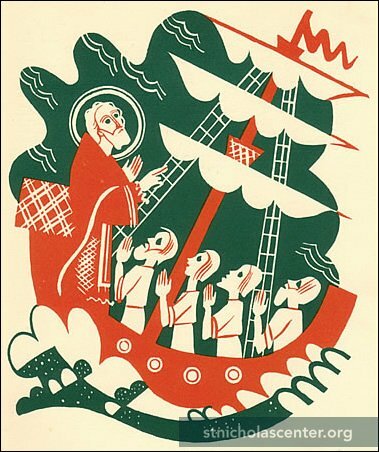 Artist: Elisabeth JvanovskySailors, claiming St. Nicholas as patron, carried stories of his favor and protection far and wide. St. Nicholas chapels were built in many seaports. As his popularity spread during the Middle Ages, he became the patron saint of Apulia (Italy), Sicily, Greece, and Lorraine(France), and many cities in Germany, Austria, Switzerland, Italy, Russia, Belgium, and the Netherlands (See list). Following his baptism inConstantinople, Vladimir I of Russia brought St. Nicholas' stories and devotion to St. Nicholas to his homeland where Nicholas became the most beloved saint. Nicholas was so widely revered that more than 2,000 churches were named for him, including three hundred in Belgium, thirty-four in Rome, twenty-three in the Netherlands and more than four hundred in England. Artist: Elisabeth JvanovskyNicholas' tomb in Myra became a popular place of pilgrimage. Because of the many wars and attacks in the region, some Christians were concerned that access to the tomb might become difficult. For both the religious and commercial advantages of a major pilgrimage site, the Italian cities of Venice and Bari vied to get the Nicholas relics. In the spring of 1087, sailors from Bari succeeded in spiriting away the bones, bringing them to Bari, a seaport on the southeast coast of Italy. An impressive church was built over St. Nicholas' crypt and many faithful journeyed to honor the saint who had rescued children, prisoners, sailors, famine victims, and many others through his compassion, generosity, and the countless miracles attributed to his intercession. The Nicholas shrine in Bari was one of medieval Europe's great pilgrimage centers and Nicholas became known as "Saint in Bari." To this day pilgrims and tourists visit Bari's great Basilicadi San Nicola. 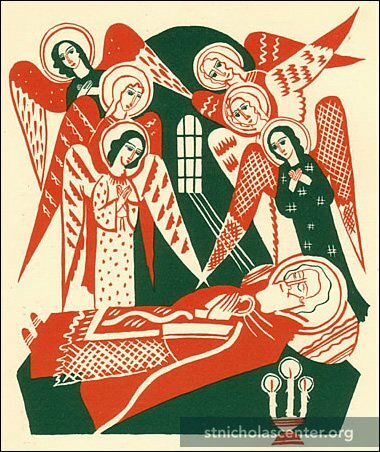 Artist: Elisabeth JvanovskyWidely celebrated in Europe, St. Nicholas' feast day, December 6th, kept alive the stories of his goodness and generosity. In Germany and Poland, boys dressed as bishops begged alms for the poor—and sometimes for themselves! In the Netherlands and Belgium, St. Nicholas arrived on a steamship from Spain to ride a white horse on his gift-giving rounds. December 6th is still the main day for gift giving and merrymaking in much of Europe. 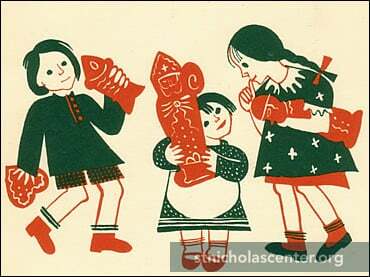 For example, in the Netherlands St. Nicholas is celebrated on the 5th, the eve of the day, by sharing candies (thrown in the door), chocolate initial letters, small gifts, and riddles. Dutch children leave carrots and hay in their shoes for the saint's horse, hoping St. Nicholas will exchange them for small gifts. Simple gift-giving in early Advent helps preserve a Christmas Day focus on the Christ Child.